The photo was taken in 1919, in Urfa. The photographer is Catholic clergy Freir Rafael. The survivors of Armenian Genocide; women, children, national figures are gathered here, standing at the cinders of their compatriots who died during the Battle of Urfa in 1915. With a condemning glance on their faces, they present to the world the horrific testimony of the crime committed by the Young Turks. Children In the first row symbolize thousands of Armenian orphans as a result of genocide. After the ceasefire of 1918, about 4500 Armenian survivors of genocide gathered in Urfa, which included a large number of Armenians who survived the massacre in the homeland after the Battle of Urfa and other Armenian-populated areas of the Ottoman Empire. 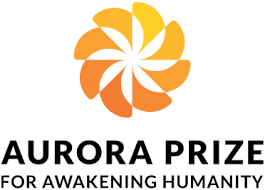 In order to coordinate the problems of survivors of the massacres, the Armenian National Union branch was formed, which, among other things, also undertook the collection of cinders of Armenians from UrfaвЂ™s destroyed houses, which was a result of self-defense. Those corpses hadnвЂ™t been buried for 3 years. Members of the Union prepared a poster with the following note; вЂњThe bases of civilization in the Near East Armenian cranes, Urfa, 1914-1919вЂќ. 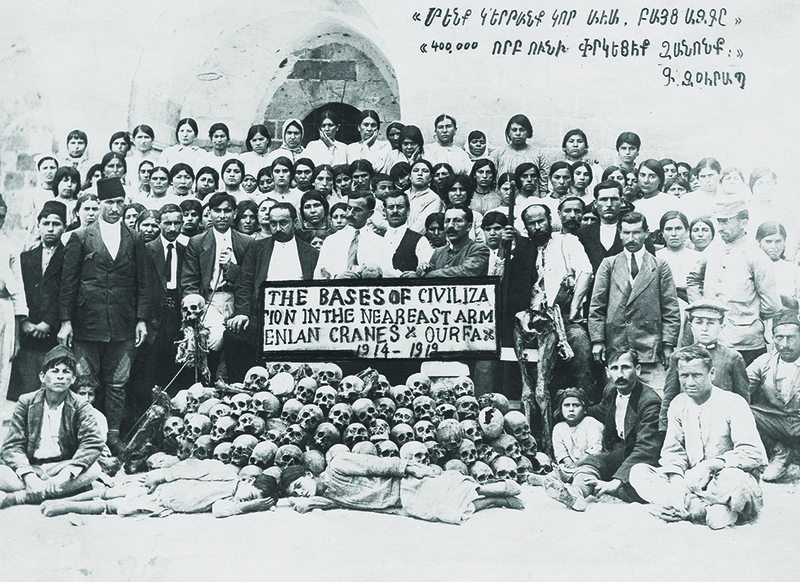 Some members of the National Union of Urfa, women and children who survived the Genocide were photographed around the poster and the skulls. Х•ne of the works of this body (Armenian National Union) is to collect hundreds of skeletons of those who were killed in the basements, houses, or died in their hiding place from the Armenian homes, and photograph them. Those skulls are lined like a pyramid, presenting on both sides skeletons. 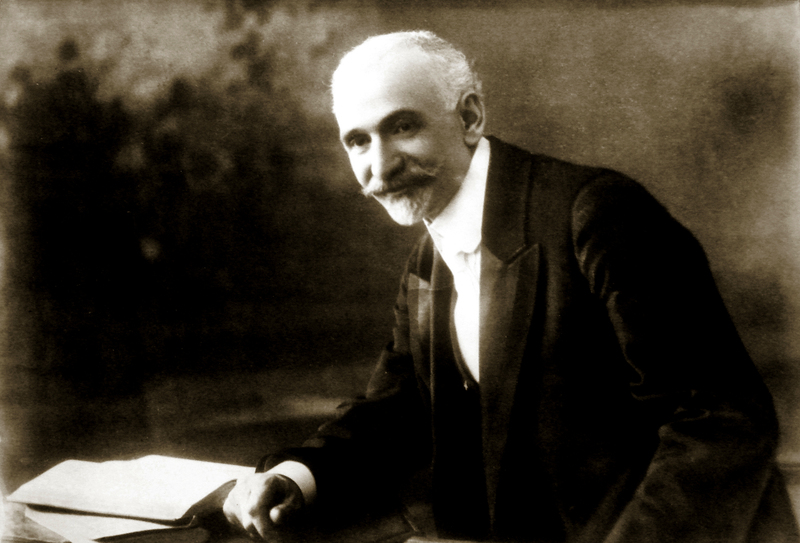 The source of the photo; collection of The National Archives of Armenia. Share your family story, Transfer your memory to generations. 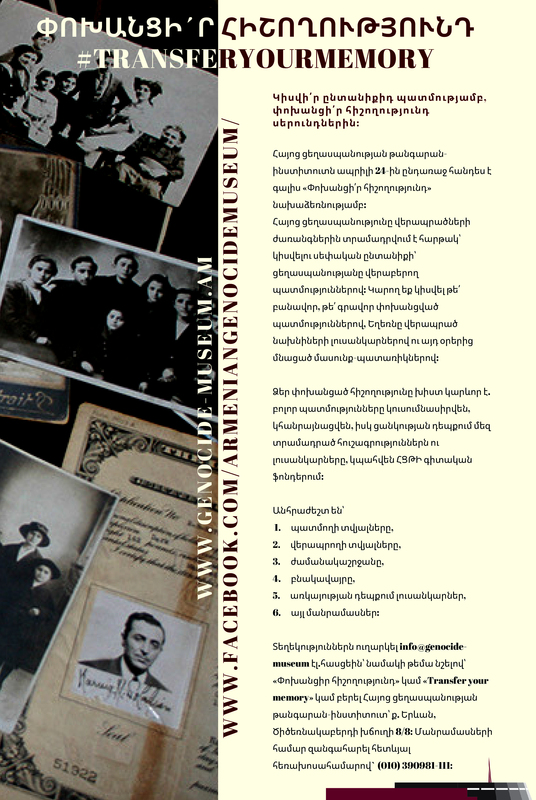 On the eve of April 24, the Armenian Genocide Museum-Institute undertakes an initiative вЂњtransfer your memoryвЂќ.